Bedford OB NWL 804 chassis 91874, with Mulliner B31F body number T324 was new in November 1948 to United Oxford Hospitals and is thought to have been attached to Churchill Hospital at Headington. In this view, it appears to have bars at some windows in the same fashion as sometimes applied to similar buses for service with the police. Ironically, for a hospital bus, it is carrying a healthy load. Photo purchased five decades ago, copyright unknown. Les, are you sure the bars are not just the frames of two half-drop windows ? A nice little bus though. Are they bars, or just half-drop windows? Yes I’m sure they’re half drop windows as the metal tops to the fixed lower panes can clearly be seen level with each other. Considering that Mulliner bodies were usually for unpretentious working vehicles they turned out some very pleasing designs indeed – the hordes of Military buses, all three services, were grand looking vehicles. 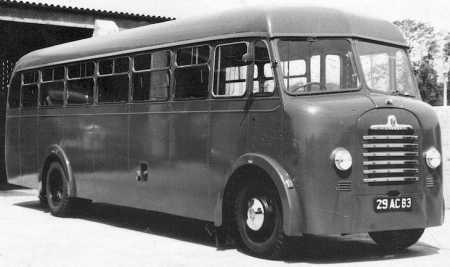 This particular design of bus body for the OB was designed by Duple, being a development of the OWB utility body, and known as the Mk.II. After building a few, Duple found their production lines overwhelmed with building Vista coaches, and so in 1947 sub-contracted a batch of Mk.II’s to Mulliner’s of Birmingham. Two bodies are known to have been sent to Mulliners to assist in producing jigs. Following the sub-contracted batch, further orders were passed by the Vauxhall dealers directly to Mulliner’s, who continued to supply the design until 1950, very many of which were exported – especially to oil companies in the Middle East or South America. Dealers are believed to have referred to the Mulliner-built bodies as Mk. III. 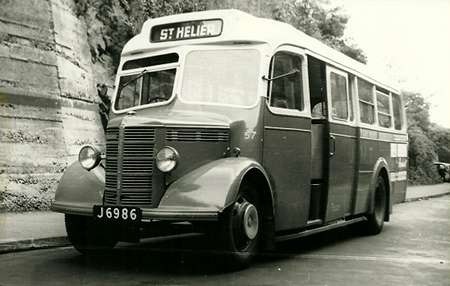 In 1949 Duple came up with a new, more stylish bus body known as the Mk. IV, and recommenced production of bus bodies for OB’s, being produced simultaneously with the older style Mulliners. 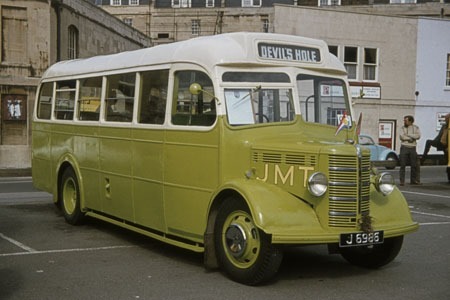 J 6986 was new to Jersey Motor Transport in 1947. She is a Bedford OB with Mulliner B28F bodywork and fleet number 57. She’s seen passing Beaulieu while taking part in a vintage vehicle run through the New Forest on 20 August 1978. The registration shown is LTR 336R but she is noted in the PSVC listing for 2012 as being LSU 857. Here is a shot of J 6986 – 57 when in service with JMT it is seen here at the St Helier – Weighbridge Bus Station. 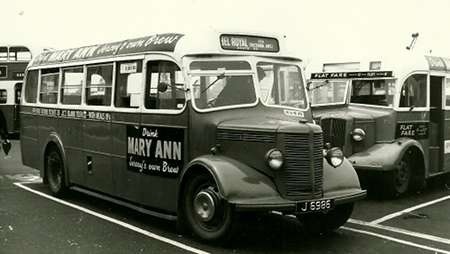 As with all of JMT vehicles of that era, it has adverts for ‘Jersey’s own Brew’ Mary Ann. It is waiting to depart on Route 22 to BEL ROYAL via (Victoria Ave). A 5 day Rover Ticket was 25/-, JCT (Jersey Coach Tours) All Day Tour 12/3 with meals 19/6. The window bill is advertising ‘The Sound of Music’, whether this was the film or a stage production is not known. No.70 behind is displaying notices for ‘Flat Fare please pay 6d in the SLOT – Children 4d’. Thanks for the response, Stephen. Certainly when I visited the island in the mid 1970’s, the buses were still advertising that brand. The cars in my posting are waiting to visit the oversize garage which Lord Montagu has in his garden! No. 70 is a 1948 Morris Commercial CVF 13/5 with Wadham FB27F body. This is a lovely little bus, the Mulliner body makes a change from Duple bodies on OB chassis. I have always thought it a great shame that so many enthusiasts tended to ignore Bedfords and Fords. To me they were fascinating vehicles which kept many small independent stage operators using them on rural stage services. I agree with you entirely Don. Not only were the OBs (and even more so their "War Effort" OWB siblings) fascinating but their performance from a 28hp petrol engine was unbelievably impressive. They were often in addition subjected to the most abominable overloading which they handled without a whimper. As far as their aural talents were concerned they were unique and magnificent – the lusty tuneful roar in the first three gears was classical music to the ears, followed by calm and quiet in top gear when their gentle rear spring twittering was most enjoyable. They were also very comfortable indeed, considering that the suspension was completely basic, and economical to run and simple to maintain – well, we’re talking legends now and legends they were for me. More than once, Chris, I’ve heard folk, unacquainted with the gearbox crescendo, associating this with the engine noise and make comments such as, ‘If he keeps flogging the engine like that, he’ll have the big ends go!’ I agree with the unbustability of the mechanicals of these little gems so affectionately held in high regard. I sometimes went out of my way to travel on the Portsmouth Corp’n OWB’s, not so satisfying, because in their latter years they were on short routes, some only 10-15 mins long! But a kind driver would let me do a return journey or two if nicely spoken to! Fortunately, no inspector ever came aboard, perhaps because it was an unrewarding pastime on fringe routes! Route 13, Milton (White House) to Locksway Road was the usual one, busy solely for the mental hospital it served. I have found a near side view of J 6986. The nearside view of J.M.T. Bedford OB with Mulliner bodywork was taken at the Snow hill bus station in the early 1960’s just after a re-paint loosing its characteristic cream stripe below the windows which was bordered with a green stripe. originally she had a cream bonnet top and the cream on the front ran down to the mudguard level.She entered service in June 1947 and withdrawn in July 1969. Originally used as a coach from new until March 1951 and there after as a bus. She ran from 1947 to 1951 in the B.E.A. livery of grey and red before being painted in the green and cream bus livery. She came from S.C.S ( Safety Coach Service) as a chassis and new in 1946, she was going to be bodied by Jersey Motor Panels for S.C.S but the company was taken over by the J.M.T in November 1946. The chassis was sent up to Mulliner for the bodywork to be fitted. The first vehicle in Jersey to have Mulliner bodywork. My dad used to own what was J 6986 or LTR 336R. He bought her from a man called Sandy in New Milton Hampshire early 70s. She was in rather a sorry state, as it was being used as a green house. Dad brought her back to Breamore near Fordingbridge, where he was curator of the countryside museum there. He completely stripped her down to rolling chassis, repaired and renewed timber frame where needed. He managed to save the panels and beading on the body, took some straightening. Gradually she came back to life. He put her back in her Jersey colour green and cream and named her Maralyn. We used to do Bournemouth to Bath road run with her. Great fun, have to see if I can find some photos. Dad retired about 1979 and moved down to Tiverton Devon with me. Then in 1981 we all moved to Wellington Somerset needless to say the bus came to. Unfortunately dad had to sell her, can’t remember where she went, but not long after we heard she was sold on again, I think she went up to the Kent area,. Dads name was Pat Wale if anyone has the logbook to her. Lost dad 2003, Hope this is of some interest. Does anyone know where she is now? Thanks for your contribution, Shirley. I lived in Blackfield at the time of my original posting. I see you mention Tiverton. My wife’s side of the family has a branch there, in sight of the canal. Small world! Hi Peter my family came from Blackfield my aunt still lives there. We used to live at the Mazery at the top of canal hill Tiverton. We had the bus parked out the back of the house. Any relation to Richard Davis from New Milton Hampshire. LSU 857 passed to Dr Mark Sleep t/a Ages Past of Eversley 8/08 and is now part of his wedding hire fleet. Now painted Green & White there are numerous pics of it on Flickr. No relation at all to the one you mention in New Milton. I have the Welsh spelling (IES) where he has the English spelling (IS). My grandfather was actually a Welshman! Chris Y correctly gives the stated output of the OBs petrol engine as 28 hp, but this was the RAC rating, an absurdly inaccurate and outdated method of measurement from the early years of the 20th century that some manufacturers seemed reluctant to ditch. The 3519 cc engine actually developed 72 bhp, not that far short of the 85 bhp of the Gardner 5LW in many 1940s/1950s double deckers. In the early post war years, a Bedford OB with the Mulliner body could be bought for £1290, which compared well with the £1415 that was asked for one with a Duple Vista coach body. Despite the obvious price advantage in having the attractive OB Mulliner coach body, it remained relatively rare, compared with the Duple ones. I took this photo of the delightful J 6986 at the end of the Bournemouth to Bath Rally in about 1977. Thanks to all its lovely to know the old girls still going strong dad would be very proud. I see in the photo she still has her lucky heather in the grill mum put that there when we took her across the New Forest. Now I will have to find those photos won’t I.
Stephen, I confess to being astonished that the RAC engine formula was still being used for vehicle taxation purposes as late as 1947. I suppose in the early years of the 20th century using the cylinder bore measurement was a roughly consistent method of assessing horsepower when long stroke engines were the norm, but the RAC formula very soon became hopelessly inaccurate as engine design was refined. Its retention until 1947 in official taxation circles seems barely credible. It just goes to show how remote from reality are our politicians cocooned in their Neo Gothic ivory tower at Westminster. DVLA still get engine capacity wrong. They often get Cubic Centimetres mixed up with Cubic Inches which of course engines of most buses & commercials are quoted in. So we get 330cc in the case of a 330 cubic inch Bedford engine. The Bedford SB was the successor to the ubiquitous OB. Launched at the 1950 Commercial Motor Show, it had big shoes to fill. It was Bedford’s largest PSV chassis yet, some 17’ 2” long, and possessed a four-speed synchromesh gearbox. Common at the time, but disappearing fast, it had vacuum brakes and a six-cylinder 4.9 litre petrol engine, developing 115bhp, more than the OB, but still modest for a much larger, heavier, vehicle. It became a big seller in India, Pakistan, Australia, New Zealand and Africa, as well as in the UK. The largest fleet of SB buses in the world belonged to New Zealand Railways Road Services, with 1280 SB buses, built between 1954 and 1981. It proved versatile, too, being used as a basis for specialised vehicles, such as mobile libraries, even cinemas, plus civil defence control units. The SB chassis, with all its variants, was the longest-produced PSV chassis Bedford’s built, maybe ever built, production not finally ceasing until 1987, 37 years in total. Bedford’s commercial products were well regarded at the time by the Armed Forces and the SB chassis found favour, too. Willowbrook and Strachans built many of the bodies for military Bedfords, but here is a rarer example, sporting a Mulliner body, in the long-obsolete RAF blue-grey. It looks new here, with no roundels or insignia. Note the minute sidelights and the surprising amount of chrome ‘bling’ around the front of an otherwise utilitarian vehicle! I recall these vehicles in my RAF National Service days, but their use was usually confined to ferrying personnel from married quarters to camp, RAF family events and sports-minded airmen to sports events on Wednesday afternoons and Saturdays. I was neither married (no money) nor sport-minded (no talent)! The usual mode of travel for us airmen was the rather less comfortable Bedford RL 3-tonners, sitting on fold-up longitudinal benches in the back! However, my sole trip in an SB, from RAF Stafford to RAF Wellesbourne Mountford, showed them to still posses some of the OB’s character – whining gearbox, plus under-powered, but willing, engine, even when lightly loaded. Strangely, though, I can’t recall anything of the interior, not even the seat coverings! Maybe someone can enlighten me? This picture brought back many memories to me (not all pleasant) of my service in the RAF. Being one of the last National Servicemen; I reported to RAF Cardington (now a housing estate) on the 14th of August 1960. After basic training at RAF Bridgenorth I was posted to RAF Wheeton for driver training and then ended up at a Thor missile base at RAF Hemswell in Lincolnshire. Upon reporting to the motor transport safety officer (actually a corporal) he noted that I had served an apprenticeship at Vauxhall Motors. As this was the company that built Bedford buses he ordered me to jump into a handy SB and drive it around the airfield perimeter road. Although I had never driven a bus before I completed this task with ease. Then he asked first for my RAF driving license and then if I had any interest in sport. I gave him the license and answered ‘no’ to his question. He then produced a rubber stamp and endorsed my license with the words "qualified bus driver". That afternoon I collected a happy crowd of footballers and supporters from the camp gates and wondered if they would be quite so happy if they knew it was my first trip on the road behind the wheel of a bus! Luckily all went well and I continued to enjoy many happy hours behind the wheel of these and many other interesting vehicles. I don’t know how to thank Chris H and John enough for this contribution as it details my own very happy experience considerably. I was on National Service from October 1954 -56 and these superb vehicles were entering RAF service in considerable numbers. I have been unsuccessfully seeking photos of them, and of their glorious OWB RAF predecessors, for decades and what a magnificent picture this is. I joined up like John at RAF Cardington and was transported from Bedford station in an OWB – my delight at this conveyance was dispelled in seconds by a vicious "official" who left us in no doubt about the doom which was to be our fate for the next two years. After radar training at No. 2 E & W School at Yatesbury in Wiltshire I was posted to RAF Patrington near Hull, where my long acquaintance with both types of Bedford was a daily delight. The Domestic Site was approximately five miles from the Technical Radar Site at Holmpton near Withernsea and all shift changes (24 hour operation) were "by Bedford." The "PSV" fleet usually used consisted of two new SBs and a magnificent "War hero" OWB, the latter normally being expertly and lovingly driven by Sam, a civilian employee from Patrington village, who wore a chauffeur’s hat for the purpose. Chris H was treated to luxury indeed when he travelled in the "RL" three tonners of which we had a couple, but we normally screamed merrily and delightfully along the country roads in a "QL" with similar seating. The fabulous sounds emitted by the latter were a real joy to me, except when it was being "flown" by a twelve year regular SAC who was just finishing his time with us after several years assisting the population explosion in Hong Kong – or so he constantly and graphically boasted – but his driving was dangerous and abominable beyond description. Enough digressing, sorry, and now to return to our "PSV" trio. My joy at the picture above will be apparent when I say that the bus is from the same batch as our first one at Patrington, so I doubt if I’ll ever see a more pertinent photo now. The vehicle was 29 AC 52 and its slightly newer twin was 30 AC 52. The OWB was 00 AC 62. The interiors of the Mulliner bodies I can remember with utter clarity. They seated thirty passengers on very tidy and comfortable seats upholstered in attractive mid blue leatherette type material – the seats had "quick release" wing nut mountings for rapid conversion to ambulance use, for which purpose longitudinal rails were fitted in the ceilings – the ceilings being in pleasing cream gloss paint. Double hinged doors in the back of the bus enabled stretchers to be loaded and I seem to recall that either eight or sixteen could be accommodated. As you entered the bus there was on one of the step risers the inevitable RAF descriptive brass plate describing the vehicle :- COACH SERVICE CONVERTIBLE TO AMBULANCE, BEDFORD 4 x 2, MULLINERS LTD. The wording may not be spot on, but near enough. A nice shot, although I would query the seating configuration given in the heading (C29F) – most of these were B36F and weren’t anywhere near as rare as the text seems to imply. As well as the large number used by all three armed forces SB/Mulliner buses were also supplied to other government agencies such as the UKAEA. Some went to civilian owners after demobilisation and seemed to be particularly popular with operators on both sides of the Welsh border ranging from Mid-Wales Motorways to Primrose of Leominster. There was also an "airside" version with perimeter seating which was used at Heathrow and other airports. Can anybody come up with an estimate of how many of this design were produced in total? I believe Mulliner became Marshall but were they always based at Cambridge Airfield – or was that just Marshall? I could be wrong, but I think that Mulliner was a Birmingham area company, and that it was only the "basic bus" part of the business which was sold to Marshall – Mulliner also made specialist bodywork for cars (as hearses etc), ambulances, and the fire brigade sector. Their last attempt to gain a foothold in the mainstream PSV market came in 1958 when they produced a pair of futuristic coach bodies on Guy Warrior chassis, one of which was exhibited at that year’s Commercial Motor Show. "Spot On" later produced a 1/42 scale diecast model of this vehicle – the only coach in their range which made Dinky Toy’s choices of a Maudslay/Whitson observation coach, a Duple Roadmaster, and a BOAC Commer-Harrington Contender look relatively sane! I’ve just realised that its 57 years today since, at Her Majesty’s command, I joined the RAF and reported to the still famous RAF Cardington with its airship hangars. In a little over three months I was to become an almost daily commuter on the beautiful Bedford SB/Mulliners – in some ways it seems like yesterday, and in others like centuries ago !! I am just a shade too young to have been "eligible" for National Service, Chris, but I attended RAF Cardington as an ATC Cadet for one week’s Summer Camp in 1956. My main memories are, of course, the massive airship hangers, and also the flights we were given in de Havilland Chipmunks. Cardington has no airstrip, and we were flown from the football field. Bouncing over the rough surface at speed with every appearance until the last minute of taking off through the goalposts is an experience not easily forgotten. Well, fancy that Roger C – so the expertise gained during the Dambuster raids had peace time benefits too eh ?? Thank goodness, Roger C, you didn’t score an own goal! For all you ex RAF types who seem to have many memories of both Bedford SB’s and RAF Cardington, I have just uploaded a video onto Youtube showing Cardington Camp as it now is. It is titled RAF Cardington 2011. You will hardly recognize the old place now! Wonderful little film John, thank you very much. Incidentally I made that famous inward journey in a wartime RAF Bedford OWB bus, and you had the first letter right, but it was TERROR rather than trepidation. 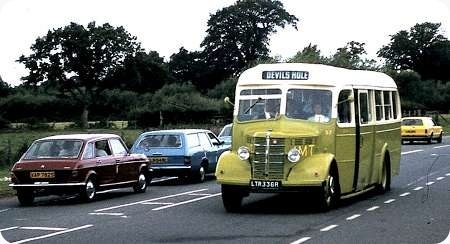 A week later the outward trip was in a brand new Bedford SB/Duple luxury coach of Worthingtons Tours – new bulging kitbags in the boot – to Number 11 School of Recruit Training, Hednesford – what a civilised sounding name for the Staffordshire hilltop Hell hole !! Incidentally, what sort of vehicle was the film made in, as it made some rather pleasing transmission noises as you went along ?? Thank you for your kind words Chris concerning my film. You were lucky to leave Cardington Camp in the luxury of a coach! Were were marched across the fields at the rear of the camp to the now defunct Cardington village railway station. There we caught an ancient steam hauled train pulling clerestory roofed carriages adorned with dusty blue moquette seating and oval Victorian pictures of Bournemouth in its heyday. It took eight hours to reach Bridgenorth, another RAF hellhole but this time in Shropshire. I knew we were in trouble when I saw the inmates polishing the trees. The car used for filming was my wife’s ancient Suzuki Ignis and yes the gears do whine that maybe has something to do with 70 000 miles plus on the clock. It can’t compare, however, with a TD1 in full chat! Thanks indeed John for those further poignant and amusing views. I’m sure that my school friend Keith and I travelled from Bedford to Cardington in that very same ancient train. At least we were spared the polishing of trees at Hednesford, as nothing grew up there in November and December – ever since 1954 I’ve had a close affinity with the musical classic "In the steppes of Central Asia." Your good lady’s car makes most appealing sounds and, while I agree that it must come a close second to the TD1, there is a definite resemblance to the lovely effect used by the BBC in olden days when vehicles in radio plays were moving off – happy times now gone. Ah yes – the BBC sound effects of a bus moving off. If memory serves me right, I read many years ago that the standard recording used by the BBC in the fifties / sixties was actually of a London Transport STD class of the Leyland TD7 utility version. From the crew’s viewpoint, this was the most unpopular of the various utility types that London Transport received during the war years. But I doubt that the BBC recording department were aware of that fact, and presumably just asked for a bus and driver they could use. I wonder if this recording is still available now? Nobody travels in buses to school in plays any more. They are all running Millie to school etc etc in their MPV/4×4’s! Although I didn’t serve in the Forces (although I did spend eight years with the ATC), I did enter another example of a parallel universe in 1960 when I joined London Transport in a clerical capacity. The absurdities of this organisation astonished me, especially the endless compilation of useless statistics and percentages. As an example – one had to explain why accidents to dogs had increased by 100% from one accounting period to the next. Answer – two dogs had been run over instead of one. Michael’s comment about BBC sound effects puzzles me, because my recollection of BBC broadcasts during that period was that the standard bus sound effect was an RT, although I didn’t realise that at the time. Having only met Leylands, Daimlers and Bristols in the real world, I was intrigued as to how something that sounded to my childish ears like the engine of a tractor married to the gearbox of a vintage Bentley could possibly be a bus. It wasn’t until I spent a few weeks in RT-land in 1965 that all became clear. There was definitely no clutch judder, which there presumably would have been on a TD7. Peter, thanks for your comment on the BBC recording. I only vaguely remember it myself, probably in Hancock’s Half Hour or similar. At that time I would not have known the difference between any of the bus types discussed here! However Buses Illustrated ran a series on the London STD class in the mid- to late sixties. The statement that the BBC recording was of an LT STD class TD7 was made either in the article itself, or in correspondence in later issues responding to that series. It may be that the BBC also used an RT recording at times, but my impression from the information in BI was that it was usually the TD7 which was brought on. My observations – as a radio addict – are that the most common recording star was an RT (preselector) type of vehicle or something akin to a petrol Bedford SB. When they do the school bus/local bus on the Archers (they were doing it quite a bit a year or two back) I could not identify what they used. [Having driven most of what might be expected on rural/school routes, I think I should have recognised it – but do they make do with running a BBC van around the car park these days?] Whatever happened to Commers or Dennis Lancet IIIs? David, I think I know the Archers recording you are referring to – the one where Will first met Nic on the bus? It must have been some sort of archive recording, as it was clearly underfloor-engined and semi-automatic. Someone elsewhere has suggested an AEC Reliance. There seems to be a general problem with recordings of rear-engined buses, possibly in that the sounds are not recognisable out of context. So much so that even in British films and TV programmes, a recording that gives the impression of the engine being closer to the camera is often preferred. Most bizarrely I’ve seen a Bristol VR accelerating past the camera with a recording of what sounded like a Ford Transit! That may be why Hollywood seems to prefer rear views of buses accelerating away from the camera, which works much better (especially with a Detroit 2-stroke!). I stumbled across this thread whilst Googling for the body builder of the RAF coaches. As an ex-Brat (RAF Boy Entrant) I too have fond memories of these Mulliner bodied SBs, both in the UK and on detachment to Nicosia where they had cut away rear ends to prevent them grounding on some of the narrow mountain roads where the bends were lined with rocks. Back in the late ’50s when EOKA were active, the road through the mountains from Kyrenia to Nicosia was one that I recall as "interesting". A couple of times we managed to hit the rocks with the back end so I guess our rear wheels must have been rather close to the edge! From memory almost every UK RAF flying station had at least one Mulliner/SB and some had two. They were also to be found at RAF stations throughout the Middle East (Cyprus, Aden, El Adem, Arabian Peninsular etc.) as well as at civil Ministry of Aviation establishments such as Farnbrough and Pershore. A photo (my copyright) of a Pershore operated example can be found at http://www.transportphotos.com/road/photo/JM12052 This differed from the RAF variant in that is did not have the rear doors but did have extra side mouldings below the windows as well as a destination display box. Another variant with full height opening windows (suggesting an export to a hot climate) can be found at http://www.transportphotos.com/ This one was photographed at the Royal Group of Docks awaiting export in 1951. Am I right in thinking that some police forces also used this combination? Like many of you above I’m also an ex serviceman but Royal Navy. 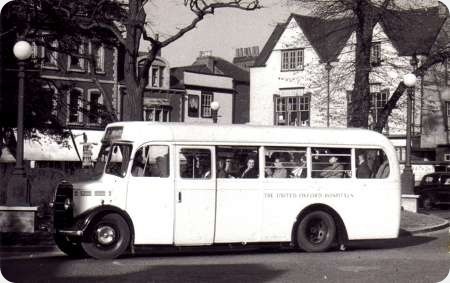 My first memory of these buses were three Bedfords, 2 x SBs and 1 x OWB in use at at HMS Mercury in 1958. I also subsequently came across and travelled daily on RN SBs in Malta during 1960 and 1961. For many years I have been attempting to establish the roof livery of the Malta based RN SBs? Was it dark blue as in the UK or a different colour? Despite in-depth research, no RN vehicle records appear to have been retained by MoD(N) or can be found elsewhere? Any help would be much appreciated? In reply to Mac Head I would imagine the roof livery to be white (to reflect the heat from the sun). This is my recollection of the SB at Kai Tak. Finally, without any prompting, Phil has come up with recollections the same as myself – a white roof. All ex servicemen I had previously questioned appeared to think they were painted the same colour as the bodywork. Reply to Mac Head, if you go onto airliners.net and key in Bristol Britannia on the search box a list of Brits will come up. On the first page scroll down to the 12th photo which should be xm 489. Now click on the white xm 489 text to the right of the photo and 4 images will appear, the last one will show what appears to be an R.A.F SB coach with a white roof at the side of the Brit. hope this is of help to you. 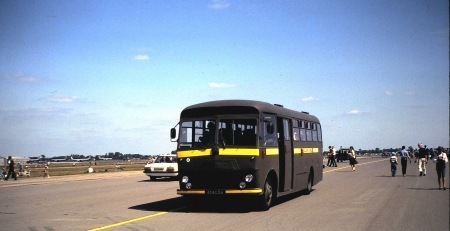 My first ever trip in a RAF service vehicle was a Bedford SB (of the same type as the one seen in the picture at Fairford) in April 1979 when I was, with many other recruits picked up at Newark train station and then taken to my basic recruit training at RAF Swinderby situated on the A46 between Newark and Lincoln. I seem to remember it was rather utilitarian, matt green and looking a bit run down, with green leathercloth seats, I remember they had taken out the two rear rows to allow room for all our baggage. My next personal encounter with one of these buses was a LHD version in Germany in 1981/82. Again tatty overall matt green but with RAF blue grey insides, this vehicle was used to take us Squadron Erks onto Harrier Force field deployments, which lasted until such time you were trained to drive, or became the designated passenger in one of the Squadron "Luxury?" Bedford RL trucks, (or as my Sargeant called them, " A Four and a half litre drophead coupe, with a capacious boot!") I remember these trucks were also RAF blue inside with a plate giving instructions on preparing the vehicle for air transport in Argosy aircraft! (By then long out of service). I remember these SB’s were replaced in the early to mid eighties with Wadham Stringer bodied Bedford buses and plain looking 36ft long Marshall bodied buses, Leopards I think but I may be wrong on this. They were painted in various strange light blues whites and greens. I understand this was because a camouflage green bus was seen as an easy spot for a terrorist ambush by the IRA, and making them look like a civvie vehicle would reduce this risk. Your assumption is right, Steve. I recall that (verified as February 1972) the IRA blew up a coach carrying soldiers on the M62 motorway, killing 9 of them, plus 2 civilians. However, it was a civilian one and it would appear that it was specially commissioned to carry British Army and RAF personnel on leave with their families to several bases – including Catterick in North Yorkshire – during strike action on the trains. From this atrocity, I imagine that the MoD decided, poste haste, to (re)paint their own passenger vehicles in various colours for some years. My recollection was that they were keen on pastel shades. although pink was never used, to the troops’ relief, I suspect! As for the Bedford RL’s description of being a " A four and a half litre drophead coupe, with a capacious boot! ", in my time it was the ubiquitous (to RAF only)Standard Vanguard pickup seen HERE: www.flickr.com/photos/ As they rotted with the same speed as the Alfa Sud, it’s amazing one has survived! Trivia from the "pen" of a crinkly. I know a lovely lady in Woking who recently retired as a physiotherapist at Headley Court. She was actually a squaddie who survived that M62 coach bombing. I think it influenced her choice of subsequent career. During my time in the RAF (1954 – 6) the Service had large numbers of Standard Vanguard cars and vans, as well as the pickups. In view of the atrociously high fuel consumption and excessively luxurious ride of these vehicles it seems the strangest imaginable choice when, presumably, economic operation was desirable. The mention of the M62 coach bombing reminds me that this Sunday[10/2/2013] there is to be a memorial service at Hartshead Moor Motorway Services for the victims. There has been a plaque there since 1975 and there is an annual service on the Sunday nearest to the actual date. My family had the estate car version of the Phase 2 Vanguard. As Chris Y says, heavy on fuel, but very comfortable. It carried all our camping gear for a family of 5 and gave several years’ good service. It certainly didn’t suffer the ravages of the rust worm that Chris H mentions – perhaps this was due to the fact that the bodywork was provided by a proper coachbuilder, Mulliners. And with mention of Mulliner’s, Alan, our meanderings come the full circle! Just stumbled on this site looking at other Bedford buses. I have owned a Mulliner bodied one for around 20 years now. I also converted it to live in and have lived in it all this time. I have converted it to lpg and it runs lovely on it. Here is a link to a picture. Thx for the posting, Pete. Your photo shows how sound these vehicles were – sixty years old and still going strong! Hopefully, you’ll find it a good resting place if you need to dispose of it at some time. Any idea of the original registration? 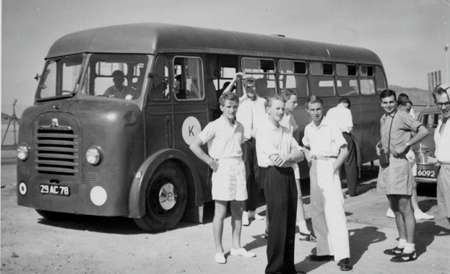 The registration number carried will have been its original one, there was large batch of Government owned buses with RGX registrations-in fact all the London registration series RGX was allocated to the government starting in May 1955. Thx for the info, David, which I didn’t know. I am most interested in the site, I was at Bridgnorth after square bashing I went to Wheeton on a driving course .. Austin 1 tonners and light cars Vanguards I recall 1960/1..I was posted to Goldsborough .. wonderful posting 5 miles North of Whitby, At this time I was taking Bomb disposal crews to Fylingdales on York moors in 3 ton RL Bedfords.. They were un-suitable and we were allocated a coach.. cant remember number and I too was given a run to Middleton St George now Tyne Tees airport.. I passed and had 1629 endorsed and away I went.I remember the very light steering semophor indicators later fitted with flashing indicators.., they were really great runners.. Happy days Geoffrey Pallett ex SAC 5131 bomb disposal sqn 19 61 /3..now 72 yrs old and still have hair. location Tamworth Staffs……bye.. In reply to Chris .. the reg. is original and is RGX 323 and is still carried on the vehicle. I am hoping to take it out on a run to Aberystwyth on the 15th Aug for the weekend. Good luck – hope it runs well. Let’s see a photo after the event. Well the wheels haven’t turned yet .. I am low on funds so wasn’t able to go. Its about 50p per mile on LPG have been busy repainting it though so will be looking good for when I eventually get it out on the road again. I have only just found this very interesting site and would like to add something of my time in the RAF.As most writers I started at Cardington then on to Padgate for square bashing then Weeton for driver training. Although I was called up for National Service I signed on for 4 years. I was posted to 2 Motor Transport Squadron at Lichfield in Staffordshire. 2 MT was the long distance heavy vehicle section of the RAF. Also at Lichfield was 99 Maintenance Unit, responsible for collecting new vehicles from the manufactures for onward transmission to stations all over the World. If 99 MU were short of drivers we at 2 MT helped out by going to the manufacturers to collect vehicles. This was my first introduction to the Bedford S.B. Coach which we collected from Mulliners of Birmingham. Along with the Bedford R.L. The Standard Vanguards we collected from Coventry and Land Rovers from Birmingham.These were good days out as we were normally given a rail pass if there was only a few of us going and a bus from the nearest station to the manufacturer. Because on 2 MT Squadron we only had lorries and no coaches it wasn’t until I was posted to Seletar in Singapore that I caught up with the Mulliner Bedford again. It was a very nice vehicle to drive so smooth and quiet with the petrol engine. We had, at Seletar, another type of Bedford S.B which was not as bulbous at the front and looked flimsy against the Mulliner, but I cannot remember the name of the body builder, perhaps someone will know and enlighten me. We also had, which I loved driving was the Commer Commando deck and a half airport coach the same as B.O.A.C. and B.E.A. were using at the time. Like Brian my RAF career followed almost the exact pattern. Induction Cardington – where I also did my square bashing, then Weeton and (via Martlesham Heath) Lichfield but to 5003(AC)Sqdn. Also like Brian I did 4 years because the trade of ‘Dispatch Rider’ was unavailable. I recently looked over a fine preserved example of the Commer Commando at the Elvington Air Museum www.yorkshireairmuseum.org/exhibits/ and, with further ‘googling’ – on Reg No – you can find more information/photos of this vehicle. Funny what you come across when idling over the keys on one’s computer, my mind was taken back to the summer of 1956 when I became a guest at the behest of the government of the day’s two year National Service scheme. It must have been on arrival at Bedford station (via Devon, London St.Pancras and Bedford) when I first encountered things RAF, for there waiting for me and similar such lambs to the slaughter, was this blue RAF bus. Here started my two year journey not knowing what lay ahead, suffice to say Cardington, Padgate Hereford and 16 MU Stafford, was to be my lot. BTW, our intake left Cardington en route for Padgate from the RAF’s own station within the confines of Cardington camp. It would be so inviting to just keep reminiscing but I’ve already catalogued my two years in the RAF elsewhere on the ‘Net. Suffice to say at 16 MU Stafford, which was a huge complex spreading for miles around, RAF transport played a key role for the transporting of personnel to their place of work. Bedford three tonners was our mode of vehicle plying back and forth in all directions. The ubiquitous covered Bedford wagon were a familiar site, I remember one particular journey one evening at the finish of work of being picked up in an absolute pea soup of a 50’s fog. Hanging on to that rope strap like grim death. The aristocrat of the MT fleet as already mentioned was the sumptuous Standard Vanguard, oh how I used to lust for just a ride in one, alas I didn’t have a drivers licence at that time. Imagine my joy when on one journey hitch-hiking home, a spanking new Vanguard stopped to give me a lift, at one stage of the journey (Bristol-Devon) the driver asked if I would relieve him to Exeter. I was pained to tell him I had no licence. As I write, I have to pinch myself when recalling those times, did they really happen? I suppose most on this thread are already aware that a simple Google search will reveal hundreds of national serviceman’s tales. Just type, RAF National Service stories. Hope I don’t get told off for being off topic. I apologise for the anonymity of the immediate above comment for it was not my intention, but when I clicked on ‘Submit Comment’ I somehow thought my comment would reappear for preview editing. I was taken aback when the screen cleared, I thought my work had disappeared into the ether as so often is the case. Later,I was rather astonished to see my post had been published – for which I thank you. I lived in Devon at the time of the above memories, later moving to the midlands where I have remained to this day. In fact I’m only a stones throw from Stafford where I served most of my national service. I stared hard and long at the guardroom where we had to do piquet duty armed with a baton. I well remember one patrol at 4.00am in below freezing temperature, a cloak of frost cloying to our greatcoats – roll on demob! As for the rest of the site (of what I could see) it was still very recognisable. To the left of the guardroom is the tarmacked area where we assembled for inspection before commencing work each day, I got nabbed on a charge of ‘get yer ‘air cut, take that man’s name sergeant. My sentence of three day confined to barracks included a lost weekend. Grrr! I digress, I’m pinching myself again. I feel a reminiscence coming on, I’d better stop here. I did my post-graduate teaching year at Padgate College – on the site of RAF Padgate. For a year my regular transport included four car DMUs from Manchester to Liverpool (via Warrington) with Albion 0900 engines and SELNEC (ex Leigh Corporation) East Lancs/Renowns on the Warrington to Leigh (via Padgate/Fearnhead) service. [Apart from the modern central buildings and halls of residence, the college made much use of the ex RAF buildings for teaching space.] It was also said that part of the nearby M62 was laid along the track of a runway. To those who were associated in anyway with RAF Padgate. Google Search…. Last Parade AT Padgate 1957. I bade my farewell to RAF Training Camp Padgate in early September 1956, having no inkling whatever the camp was to close within 6 months. Why is when you are young, you assume everything around you is permanent for ever? I think there is something sound in the advice – never go back. Did RAF Padgate become the Police Training Centre, Bruche which I attended in 1966 and 1968? Oh the joy of those cross country runs and drill instruction by the former guardsman Sergeant Crompton from Rochdale. The "urban myth" about the M62 is widespread but I hadn’t heard the one about the M56 before. However the M62 DOES cover part of the width of the old main runway along a good part of its length, though the evidence that was once there is now covered by Junction 8. Photo proof can be found at www.chroma.to/photos/4052586. During construction of the M62 a number of aviation societies’ members took photos of the work along the line of the runway and these have appeared in various publications. After "closure" by the USAF in 1959 the Burtonwood site was passed back to the UK MOD in 1965. In the interim various uses had been made of the site by the RAF and Air Training Corps – including gliding by yours truly – but the withdrawal in 1966 of France from NATO military support led to the US Army taking over the site as a forward supply depot. This led to visits by US Army helicopters which used to park in front of the control tower. This eventually stopped sometime in the 1980s as they were visible from the M62 and were cited as being a distraction to drivers, the flights then transferring to Liverpool Airport. There were persistent rumours of nuclear shells being stored on the site. What is true is the site had the largest single roof building in Europe as its main warehouse. The site was used by the TA, Emergency Planners and other military units and cadet forces until the 1980s. During the first Gulf War the site was used by the US Army for its intended purpose as a supply depot, playing a major role, particularly in the build up in the autumn of 1990. In June 1994 the site was declared surplus to requirements and after 52 years since the first Americans arrived, the site was closed. Interesting stuff, Phil. My comments about the alignment of the runway not quite matching the alignment of the M62 still stand, however. The urban myth would have us believe that they were identical. I passed the base a couple of times each month in the late 50s/early 60s en route from my home in mid-Cheshire to my gran’s house in St Helens (with a change of bus in Warrington). Depending on where we were meeting her we’d use either Crosville’s 140 via Bold Heath or the St Helens/Ribble Warrington-Southport service. I’ve also seen 1959 quoted as a closure date, but I can show you records of "fixed-wing" USAF movements through the base as late as the end of 1961. Also during 1961 Burtonwood was briefly used as a commercial airport when a dodgy airline called Overseas Aviation began a scheduled service from Prestwick in Ayrshire to Burtonwood and Gatwick using four-engined Canadair C-4 airliners. It lasted for a matter of weeks despite very low fares compared to those of BEA on the Glasgow/Manchester/London corridor. Overseas went broke soon after the service ended. As regards the US military helicopter visitors, the last I’ve seen a record of took place in 1982. Throughout the mid-1960s this was a monthly operation with US top brass arriving at Manchester Airport from West Germany aboard a military variant of the Beech King Air then transferring to a Choctaw or Huskie helicopter (specially positioned from Lakenheath or Mildenhall) for the final few miles to the base. There must have been a cheaper way! I can also remember a yellow-painted Piper J3 Cub being based there at some point in the 1980s, but I can’t find a reference. It was apparently owned by one of the military commanders and took off from one of the old taxiways on an "unlicensed aerodrome" basis. Getting back to the buses, a building on the base was used by preservationists back in the 1970s, forming the nucleus of the collection later assembled as the St Helens Transport Museum. I’m a bit vague on details as I was living in Pennsylvania at the time. Can anyone else enlighten us? Neville, have a look at the photo taken after the motorway was opened which clearly shows the runway paralleling the motorway and the road occupying part of the north side of the runway. The alignment with the northern side of the runway runs towards the runway south edge at a slight angle for around 900 yards before the motorway deviates to the north a tad when it occupies more of the runway space. The Highways Agency and its predecessors have had subsidence problems on the carriageway in the early days even though the trouble spots on the runway were well known and remedial work was implemented before construction. I used the road at least 3 times a week from its opening until 1986 and there was, and still is, evidence of patching and dishing along the stretch. 1959 was the official closure as an in service US Air Force base. T-29/C-131 Samaritans and the odd C-47 did use the runway into the early 1960s though most of the flights after 1959 went into Speke. In addition the US Army helicopter movements, latterly operated by UH-1 Iroquois, ex Manchester eventually moved to Liverpool and my log books show my last sighting in 1982 on the way to a niece’s christening, which means it was a Sunday. In addition I have numerous sightings of HC-47 Chinooks on the ground in the mid 1970s. Of course BOAC ran a weekly London-Manchester-Prestwick-New York Stratocruiser flight in the mid 1960s but runway problems at Ringway meant the flight operated via Burtonwood if the weather was at all less than perfect. The Strat would have fitted in nicely with any C/KC-97s on the ground. The Overseas Aviation (C I) Airways service was not scheduled to stop at Burtonwood and any visit must have been on some form of diversion. The most authoritative version of the airline’s history appears in the 1976 publication British Independent Airlines since 1946 by A C Merton-Jones published by LAAS and the Merseyside Aviation Society. Much is made of the idea of the walk on service, the fact that passenger rights were only held between Prestwick and Manchester and Prestwick and Gatwick and no rights were held for Manchester and Gatwick and vice versa. Manchester was regularly overflown as often the crew outnumbered the passengers. Only 12 flights were flown in total by unpressurised C-4 North Stars, all Canadian registered, between July 31 and August 11 when the service ceased with fewer than 100 passengers carried in total. No mention is made of Burtonwood in the narrative something MAS, especially Ken Ellis, with full access to Burtonwood movements of the time, would surely have picked up on. Also, as Overseas had a fairly intensive inclusive tour operation at Manchester using both the C-4s and ex BOAC Argonauts, it would have made little sense to use Burtonwood with no equipment there and a journey at least twice as long into Manchester. By the end of August the company had ceased flying and it was wound up in October 1961. There was a yellow American registered Cub based there and, back on topic, sometime in the late 1970s/early 1980s a yellow open top double decker could be glimpsed when the gliders were about, presumably somehow connected. If memory serves this was an early Lodekka. Attached is a n/s print of a sister SB 29 AC 78 taken at Aden Oil Refinery on an outing from the local RAF base at Khormaksar. It is in the same digital series as Chris Hebbron’s. Mulliner bodied versions were quite common with the RAF in the Middle East, where I spent my two years at Her Majesty’s pleasure. But it really turned out to be a Cook’s Tour in the end with leave spent in Cyprus and East Africa. Thx for that post, David. Quite a coincidence to take a photo so close to the one I posted. And nice to see one on active service (all side windows open, but not the windscreen, I notice) with folk milling around. Thanks for the definitive info on this, Phil. It’s been a long time since the events and my memory may have gotten crossed wires. The Overseas machines I saw on their way in and out of Burtonwood must have been either on diversion or doing charter flights in connection with the USAF withdrawal from the base. It’s worth noting that all of Overseas C-4s remained in the basic livery of their previous owners, Trans-Canada Airlines. The fact that they couldn’t afford to repaint them might have given their bankers pause for thought. It was the biggest UK airline collapse until the failure of British Eagle in 1968. It’s most likely Neville, that the C-4s were Manchester diversions as there is no record of any US forces charters in the airline’s history and by the time the C-4s were delivered in the summer of 1961 the "evacuation" of USAF personnel was over and the Army had not really arrived. They may also have carried out crew training as the North Star had some significant differences to the Argonaut which were also in the fleet. The reason the aircraft weren’t painted is that the Air Registration Board issued temporary CofA certificates based on the Canadian Airworthiness certificates until October 1961 to allow the aircraft to be used. Thus the retention of the Canadian registrations. There were many mechanical differences and differences in overhaul requirements as well and these eventually were the straws which broke the camel’s financial back. I well remember being able to read off the registrations of the North Stars under the wings at home in Stockport. I last saw a North Star (RCAF) at the museum in Rockcliffe, Ontario in 2009, awaiting restoration. You might be interested to look at www.forgottenairfields.com/. Scroll down to the 1955 map and look at site A. Look at the runway and taxiway layout. Then scroll down to look at a photo showing site A at Burtonwood, the "M62" and the vestiges of the start of the cross runway and the taxiway. You will see the motorway coincides with the main runway. Further down are two August 1997 photos confirming the motorway pretty much follows the runway alignment. I’m not an aircraft authority at all, but wasn’t it a Canadair "Argonaut" which crashed on a filling station in Stockport in the mid 1960s ?? It had run out of fuel on approach to Ringway – or rather it actually hadn’t but as far as I remember the pilot had made a mistake in the tank switching. It was an awful disaster because it broke in two upon crashing, but didn’t catch fire for a good few minutes and even then didn’t ignite the filling station. Its possible they could all have got out, as those in the smaller front half did, if they hadn’t been too stunned to act quickly I suppose. Chris, it was a British Midland Argonaut. There was a complex cross feed arrangement between the tanks and it had been known for many years that this could lead to errors, and indeed had previously done so without fatal consequences. I have a very close relationship to the disaster. That morning I had organised a hiking trip to Kinder Scout. We used one of Bullock’s Fodens as usual and one of our pick up points was on Hopes Carr at 10.05. We picked up our four passengers and headed out along Wellington Rd South to pick up in Hazel Grove and were bemused to see a large number of ambulances heading to Stockport as we neared Stepping Hill. The aircraft hit Hopes Carr at 10.09. Some of us wouldn’t miss Pick of the Pops so we got news of the crash on transistor radios when we got to Hayfield. As this was years before mobile phones we had to drop our passengers back at Hopes Carr. This was possibly the first TV broadcast air disaster in the UK with Granada broadcasting live. On return that evening the site was swarming with spectators, (estimates say up to 10,000 people visited during the day) overwhelming the Police and was complete with burger vans and ice cream sellers. Amazingly we were able to put our passengers down within 50 yards of the crash site. As to the survivability the AIB’s post mortem reports concluded most of the passengers in the front died of deceleration effects before the fire, though, being tightly held by a shoulder harness, the pilot survived. The passengers in the rear had massive leg and torso crush injuries, some fatal others not, which prevented their escape. A motor cycle policeman was first on the scene and tried to enter the aircraft before the fire took hold. For many years there was a story that his boots had sparked the fire but this was never proved. He and some passers by did manage to extract 12 people alive before the fire took hold. Newspaper reports of the time said the pilot had chosen to put the aircraft down in Hopes Carr as the only spot of green in an urban landscape. This was nonsense as the aircraft had just flown over the vast playing fields and parkland in and surrounding Stockport’s Vernon Park. A couple more points Chris. It wasn’t a filling station but a repair garage and electricity sub station that were hit with most of the fuselage landing on open ground to the rear of the garage with the tail neatly adjoining the pavement on Hopes Carr, having missed the factory opposite. The fuselage was seemingly not split on landing, rather the pictures of the tail section broken off from the rest of the wreckage was the result of the fire, though the cockpit may have broken before the fire. Many of the reports generated by last year’s 45th anniversary have been the result of distorted memories. Had the split been evident when the first rescuers arrived they could have gained access that way rather than by the over wing exits. As I already had started an interest in aircraft accidents – especially the human factor issues – I visited the site the evening after the crash (Monday) and again later and watched the removal of the tail section. I knew one of the AIB inspectors and he, as everyone involved, was deeply upset by the spectator aspect which reared its ugly head some years later with the BEA Trident crash at Staines. Thank you indeed Phil for that most interesting but very sad account of the disaster. Just goes to show what 45 years can do to the memory of one like me from "Over the Pennines." I do seem to recall though that the Captain was called Harry Marlowe, but even that may be wrong ?? I wasn’t in the area at the time of this incident, although I regularly did the Manchester Airport Wallace Arnold service from Yorkshire – there was no M 62 at that time and it was an interesting route via Bradford and Huddersfield – a tortuous slog up the A 62 behind all those slow lorries, and then Ashton, Guide Bridge, Bredbury and Romiley (seemingly very refined) and into the Airport along a rural country road. How security has changed nowadays – the public were allowed onto the roofs of the projecting bays to watch aircraft movements and we drivers could use the Crew Buffet near the Apron where we indulged in superb cream coffee alongside Captains and Air Hostesses. My favourite planes at the time were the handsome blue and grey BEA Vanguards, very refined and elegant. The most terrifying take off I ever witnessed from the roof was an Air France Caravelle which seemed to hurtle upwards with impressive power at about 45 degrees, making me think that I was very glad I was not on board and would gladly forego the South of France for a week at New Brighton !! A confession now – although I am pretty interested in aircraft I am utterly terrified of the things and nothing, but nothing, will ever drag me onto one. I am so grateful for the Channel Tunnel as I can now reach Belgium and France from Leeds in well under six hours comfortably, a real boon, and doesn’t break the bank either. Chris, It was Captain Marlow who was totally exonerated. I spent many a day crossing the Pennines in summer and winter for work. The company I worked for thought that my patch, which was the whole of the North of England and parts of Wales and the Midlands, could be adequately covered in an 1100cc Vauxhall Viva and were annoyed when the engine died at 56000 miles after 18 months! No doubt we could exchange some great stories about the old routes across the Pennines. As far as aviation goes I got the bug as a child but was 15 before my first flight courtesy of the ATC. The Vanguard was an interesting aircraft to fly in as it had an distinct vibration which rippled down the cabin in the climb. I did many trips to and from London with BEA for £2.10.6d each way student standby, double the return price on North Western. Today I still fly regularly long and short haul and early next year my wife and I will be off around the world. So far we have booked over 70 hours in the air for the trip and we still have sectors to book in New Zealand – as well as driving from Cairns to Sydney and Los Angeles to Orlando. Both flying and driving are very run of the mill today and, in some ways, not half as challenging as crossing Woodhead in the snow on a January morning, before dawn, with the headlights diminishing as slush hit the glass and having to be in Hull for a 9.00 appointment! I’d like to take this opportunity of thanking Peter and all the other regulars here for their interest and patience when I, and many others, wander miles off topic and when we commit the odd blooper due to either failing memory or misinformation. The manners and patience here are an example to many other interest forums and are to be commended. PS: How many of us, in ignorance, have walked passed each other on New Years’ day each year at Winchester? Well David, I did the next best thing last year. I was at the Kingsbridge running day in September 2012, and after travelling out to the village of East Allington on a Bristol L5G, there was a pause for a few minutes before the return trip. I got talking to a couple of enthusiasts of a certain vintage, and with Yorkshire accents. After establishing that they had never heard of old-bus-photos, I enquired whether any of them knew of a chap called Chris Youhill. "Oh we all know Chris…" So there you are, Chris – fame at last! Perhaps we ought to wear OBP badges at Winchester and see how many of us have turned up…..
David – you and I have met, albeit by prior arrangement of course, at Wisley Airfield on one of the Cobham April days – we had a most enjoyable chat indeed about things automobile and musical. Phil – I’m sure that you needn’t worry about, as you say, "wandering miles off topic" as such postings are always full of evidence of much diligent and fascinating research which we all appreciate and learn from !! Stephen – well how interesting, and I wonder who the two Yorkshire chaps were – although I rather fear that my notoriety rather than fame my have prompted their comments !! I wholeheartedly agree with the last several comments: wearing an OBP badge at events would allow us to put faces to names and to exchange information, and–as a serial off-topic wanderer–I’d like to add my thanks to Peter for so generously tolerating deviation and for running such a good-natured forum. …..and I agree with all of Ian’s last comments…..
And so do I David – the site is the most commendable and greatly appreciated of Forums (Fori ??) and the amount of work that Peter puts in is staggering !! This is the identical model to the coach I drove (27 AC 58) during my service at RAF College Cranwell in the 50’s. One of the jobs I was given was taking the College band to Scarborough for their annual fortnight gig, which just happened to be my home town. I served at JSATC Hendon 1958-60 as a Movement Control Sapper Royal Engineers – National Service. I did many trips to London Airport/Gatwick in the Vanguards to collect servicemen from overseas who has family troubles at home. I also did a great deal of loading/unloading airport family luggage onto RAF coaches. This SB looks a bit familiar to the ones I was involved with. I want to get a good model of one – EFE or summat. I have a Corgi RAF vanguard and a Oxford RAF mini bus. They go with my many EFE Yarmouth etc buses. Would these SBs have been the only RAF coaches in the 50s? Not quite the only coaches in the 1950s Bob, as there were still plenty of RAF Bedford OWB utilities left. I was conveyed, trembling with fear, from Cardington Station to the RAF Camp in one to start my National Service career, and later at the Radar Station at Patrington East Yorkshirewe had one still in daily use – 00AC52. I also remember travelling in white painted versions in Cyprus but, for the life of me, cannot think where I might have been going. Possibly a NAAFI run or some such. I do remember that, to us kids, these buses were always "Army tin cans".